Grip Issues: Lessons Learned from 126,000 Pistol Rounds | Eagle Gun Range Inc.
I’m a student of firearms. For the past | three-plus | years I’ve made a habit of training two to five days each week at the range—both indoor and outdoor—coupled with dry-fire training at home. I’ve taken more than a dozen classes and have participated in quite a bit of GSSF and USPSA-style competition. It has been an expensive and time consuming endeavor, but as a result I’ve gained valuable insights and my skills and safety habits are much improved. One of the things to which I’ve noticed the most improvement is my grip technique and strength. These things have brought better accuracy to my shooting results. I’ve discovered that there is far more to grip technique than I ever imagined just a couple years ago. While some lessons I gained through instruction, most were learned by just practicing. A lot. Over the past three years I’ve shot 135,000+ rounds through a host of firearms, in training and competition. Most of those rounds, 126,000 or so, have been shot through pistols. I concentrate on pistols for a few reasons; among them the comparatively low ammo price and the fact that, as a concealed carrier, a pistol is what responsibility requires I be most skilled at employing. Having said all of that, I’m still just a student. I have much yet to learn and skill to develop. I am no instructor. Even so I’ve learned some lessons that I believe others might benefit from, so I’d like to share some of them with you here (Please note that some of the following advice assumes an isosceles or modified isosceles shooting stance/position). Grip strength is vital to pistol-shooting competence. It took me a couple of years to fully appreciate just how important it is for a shooter to have a strong grip. I don’t just mean grip your pistol tightly, though you must certainly do that. I mean the grip strength required to shoot well is far greater than the grip strength possessed by the average active and healthy person. For almost everyone, if you’re going to shoot well you’ve got to train your grip exclusive of and in addition to your pistol practice. Gaining the requisite strength will take time. Be patient, but keep working at it. 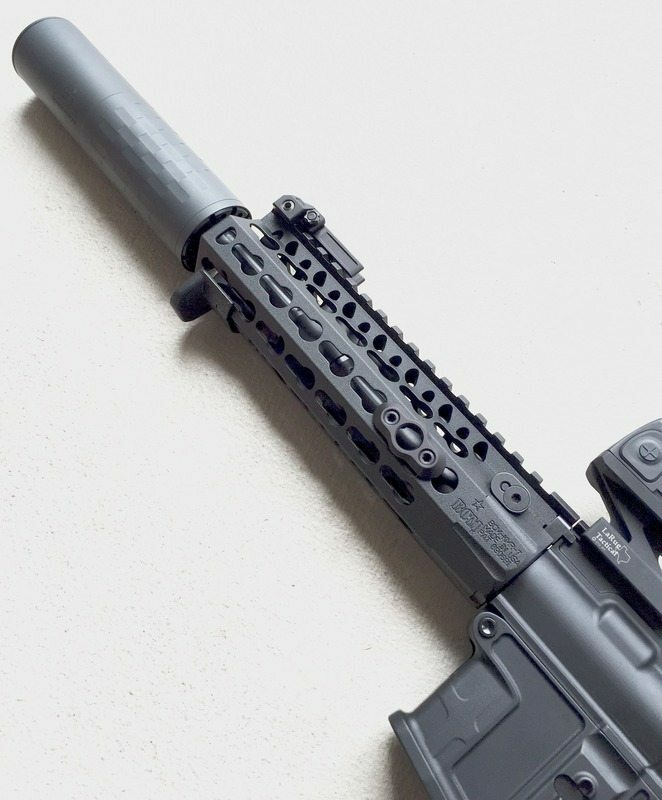 Proper support-hand leverage can greatly enhance accuracy. Your strong hand has a handle to hold onto (the pistol grip), while your support hand has more difficult job with no easy handle to grab. In order for your trigger finger to be allowed to work independent of your grip, your support hand will have to do a lot of work and exert the proper leverage. 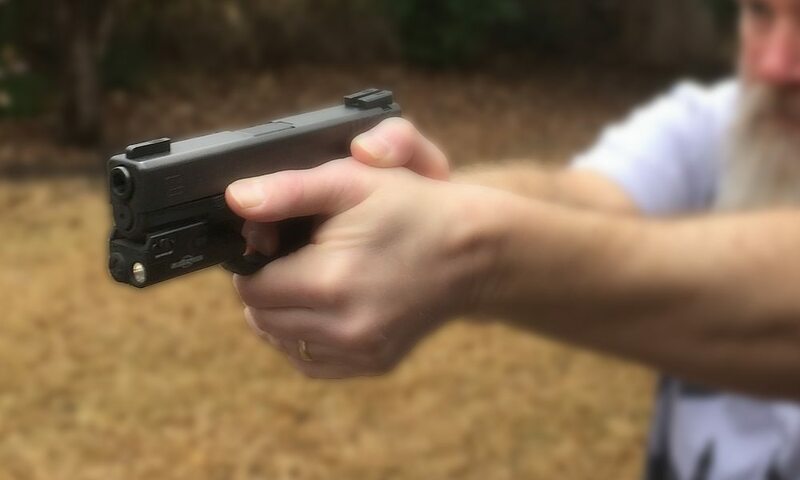 If it does not, your pistol will tend to move as the trigger is pressed, easily turning a 1” group into a 5” group at 7 yards (or a 4” group into an 8”-10” group). The thing that had the biggest impact on my accuracy was learning to twist my support hand into the pistol frame. It’s a bit hard to explain, but while you’re gripping strongly with both hands, use your support hand wrist to twist or crank your thumb horizontally into the frame—toward your strong hand—almost like you’re trying to crush the frame. Doing so will better keep the gun still during trigger press AND greatly mitigate muzzle flip…or stop it altogether. Proper grip and recoil management require proper arm position. With your elbows properly positioned outward, you can use your pectorals to press your hands toward each other (again, like trying to crush the gun). Additionally, you’ll be able to employ a proper grip and exert proper torque in your grip. Outward-facing elbows allow your arms and pectorals to greatly manage and fully absorb the recoil, saving your body from being moved around. By way of demonstration, here’s a short video of me shooting a Glock 19. I’m not big or overly athletic; only 5’10” and of average build. Notice the almost nonexistent movement of the pistol and my body during the shots. I’m just employing the techniques listed above. Self Test: Your pistol, hands, arms, and body should barely move during shooting, if at all. This is a way to check if your grip and position technique are correct: film yourself shooting—from the side, preferably. As you shoot, the gun should barely move and what movement there is should happen in the blink of an eye. Moreover, your arms should not move at all except to vibrate for an instant as the shot breaks. Your body should not move at all (your arms and pectorals should absorb the recoil). If you see something different than this, something is wrong. Review the tips in this article and check with an instructor to make adjustments. As I mentioned earlier, I am not an instructor and your instructor may offer you different or even opposing advice. My purpose here was to share lessons I’ve learned and was not to prescribe dogma to be followed to the exclusion of all other input. That said, the techniques and understanding I’ve detailed here have brought me improved competence and better, more predictable accuracy. I hope that they do the same for you. Sounds like some good things to work on for me, especially grip. With that in mind, what metrics do you go to with respect to the changeable backstraps on the Gen 4 Glocks? In other words, go with what “feels” good, or is there something you refer to regarding how one’s hand fits the grip? Beavertail or no? Again, there’s a difference in “feel.” I have pretty big hands, and often a single stack feels too thin; but my EDC is a G19. I guess if it feels good and I can hit what I’m aiming at is a good sign? I’m not new to handguns; I started shooting 50 years ago and am ex LEO. Like you, I’m a student and always want to learn and improve. TIA for any comments/suggestions. Pretty sure that backstrap employment should be governed by, as you said, what feels good. The only caveat I can recommend is that you pay particular attention to how the backstrap size affects your trigger reach. Your draw from holster, natural grip should place your trigger finger in exactly the right spot. Grip size can affect that. Cheers! Great information here! The technique you highlight significantly helps minimize the “bad” torque in the grip that so often manifests itself as the shot breaks. Way to keep it Objective.